I never made guacamole until last week. In my defense, the only Hispanic/Mexican/Latin food I ate growing up was Taco Bell. Oh wait. We went to Chi-Chi’s once. I remember eating fried ice cream and not enjoying the meal very much because the Spanish rice clearly came out of a can – bleach! I suspect my parents don’t care for it much either, since we rarely ate it. That includes guacamole. Which is sad really. I learned after living in Miami for a few months after colleges that freshly made, not frozen or from a can Hispanic/Mexican/Latin food tastes AMAZING! Especially if you pair it with a margarita or mai tai. Many of you suggested that I perk up my boring, newly cheese free sandwiches with avocados. Some of you suggested using guacamole on my sandwiches instead of mayonnaise. I can give that a whirl. 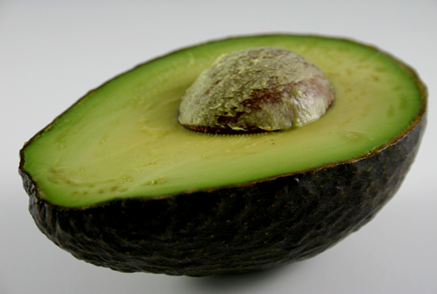 Should I be worried about the saturated fat content in avocados? Since some guacamole dips contain sour cream, which totally goes against avoiding lactose, I though it best to make my own. I turned to my buddy Alton Brown. He got me over my fear of canning with a yumtastic spiced blueberry jam recipe. Can he help me with guacamole? Oh yes! The cilantro and cumin combination in Alton Brown's guacamole recipe made my tastebuds sing! I left out the tomatoes Alton called for because we didn’t have any on hand. I substituted lemon juice for lime juice, again, based on what I had at home. I’m going to make a bigger batch to eat with tortilla chips while we watch that little football game this weekend. How do you like your guacamole? How do you like to serve it? So glad you took the plunge! 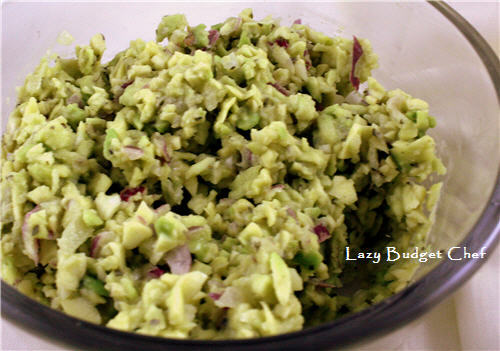 We love guacey at our house. We mash an avocado with a fork, about a tablespoon of minced onion, some lime or lemon juice, some chipotle powder and salt. This is our basic recipe to which we sometimes add cilantro, garlic or jalepenos. I buy cilantro and cumin from the store in bulk we love it so much!